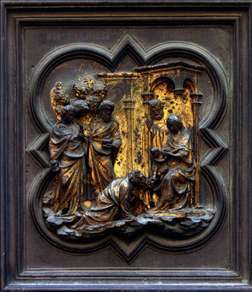 Ghiberti, Lorenzo (1378-1455), one of the most important early Renaissance sculptors of Florence; his work and writings formed the basis for much of the style and aims of the later High Renaissance. 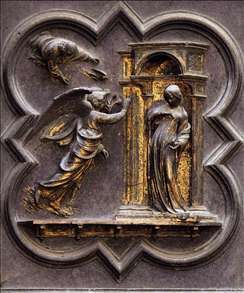 Originally named Lorenzo di Bartolo, Ghiberti was born in Florence and trained as a goldsmith; in his sculpture he showed lyrical grace and technical perfection as well as a concern for classical clarity of weight and volume. 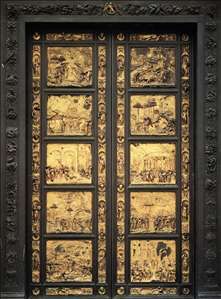 In 1403, competing against such formidable rivals as Filippo Brunelleschi and Jacopo della Quercia, Ghiberti won his first major commission, the making of the second pair of bronze doors for the baptistery of the cathedral of Florence. (The first pair had been made in the early 14th century by Andrea Pisano. ) He spent more than 20 years completing them, aided by his students, who included Donatello and Paolo Uccello. Each door contains 14 quatrefoil-framed scenes from the lives of Christ, the Evangelists, and the church fathers. 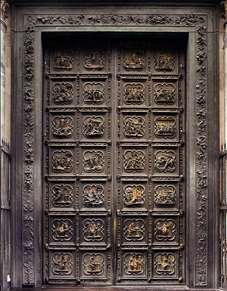 Installed in 1424, the doors were highly praised. 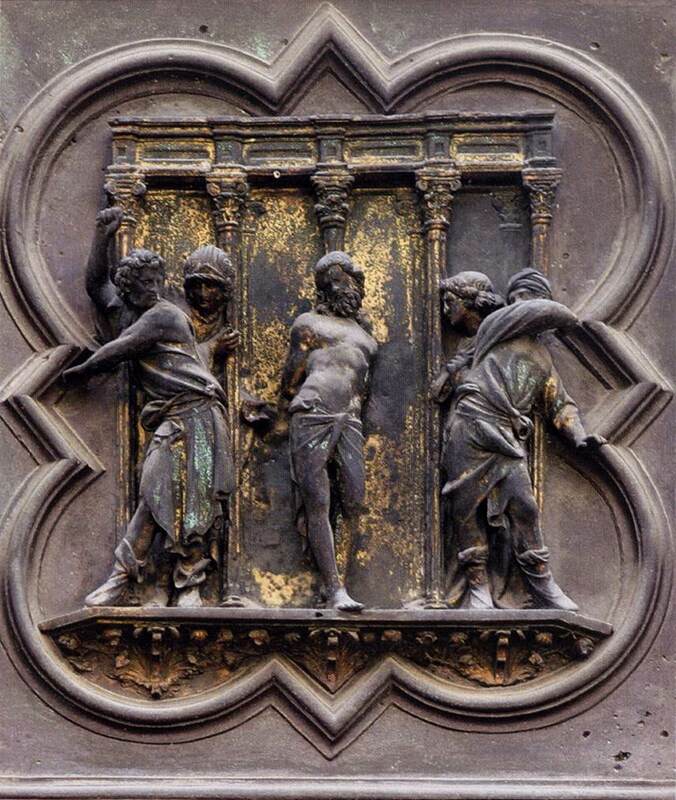 Although the reliefs were mainly Gothic in style, the later ones show an increased interest in the antique and in deep pictorial space, with the figures assuming more importance than the drapery. This transition toward Renaissance style is also evident in three bronze statues of saints he made for Or San Michele (1416-24). 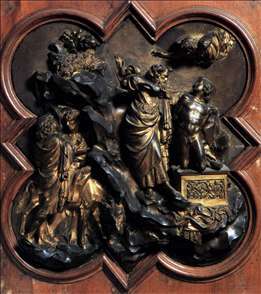 Ghiberti developed these ideas intensively after 1425. 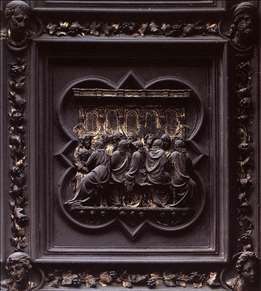 His reliefs for the cathedral at Siena (1417-27) and his greatest work, the third set of bronze doors for the baptistery at Florence (completed in 1452), show a development toward naturalistic movement, volume, and perspective and a greater idealization of subject. 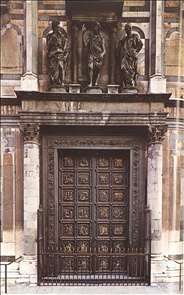 These doors, each portraying five scene s from the Old Testament, were called the "Gates of Paradise" by Michelangelo. 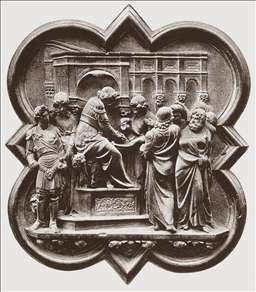 Ghiberti was actively involved in the dissemination of humanist ideas. In the Commentarii (1447-48) he gave his autobiography and expounded his views on art. He died in Florence on December 1, 1455. 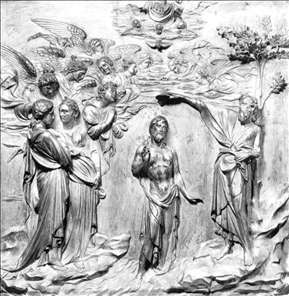 See more details about "Sacrifice of Isaac"
See more details about "North Doors"
See more details about "North Doors (Life of Christ)"
See more details about "Pilate Washing His Hands"
See more details about "The Flagellation"
See more details about "The Baptism of Christ"
See more details about "Eastern Door of the Baptistry"